Add this issue to your photographic library for information on the Canon EOS 650D and EF-S 18-135mm f3.5-5.6 IS USM and EF 40mm f2.8 STM lenses. Plus techniques on digital infrared, group photography with your EOS, battery grips and a review of Canon's software upgrades. New products EOS 650D; EF-S 18-135mm f3.5-5.6 IS USM and EF 40mm f2.8 STM lenses. 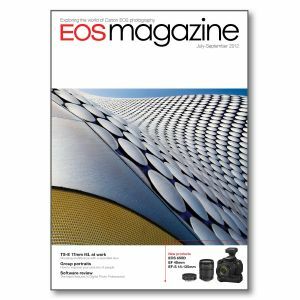 World of EOS Photographic projects and news from the world of Canon imaging, including v2.0 firmware update for the EOS 7D and Olympic photography stories for the London 2012 games. Group photos Whether you're photographing friends enjoying a holiday, a sports team celebrating a win or guests attending a wedding, group portraiture requires planning and lots of technical know-how. Focus speed If you photograph moving subjects, autofocus speed can be critical to successful images. But other aspects of AF performance are also important, whatever you shoot. Shift technique Damian McDonald was set the challenge of attaining the Associateship of the Royal Photographic Society using just a single lens to shoot a panel of images. He chose the Canon TS-E 17mm f4L. Battery grips They may not have the glamour of lenses or Speedlites, but they are useful accessories. What do they do? Do you need one? And which of the many different Canon battery grips is compatible with your digital EOS camera? How was it shot? An unusual combination of distant galaxies and close-up flowers in a single shot. Software review Canon has been busy updating the software applications which are supplied on a CD packed with your EOS camera. But you don't have to buy a new camera to take advantage of new features.